Engineers with the Hong Kong Polytechnic University have developed an electronic insole, to help running gain knowledge about the pressure put on their feet. The paired app displays information for every step. The combination aims to help prevent injuries and help rehabilitating runners start up again. Foot injuries are quite common among regular runners. These usually happen when a runner pushes him or herself to hard, without regard for their body. Stress fractures, achilleas tendinitis (inflammation of the achilleas tendons) and plantar fasciitis (an inflammation of the thick band of muscle on the bottom of the foot) are just a few of the injuries a runner risks. Most of these injuries can be prevented by slowly introducing new activity to your body. Understanding the way your feet work might help too, since running especially is something that people tend to start with, without prior training or knowledge. The insole developed by the engineers at The Hong Kong Polytechnic University could help understanding your body better. The electronic insole has to be placed inside the shoe while running. Using a pair — one in each shoe — delivers the best results. The soles sense the pressure placed on a runners feet with every step. 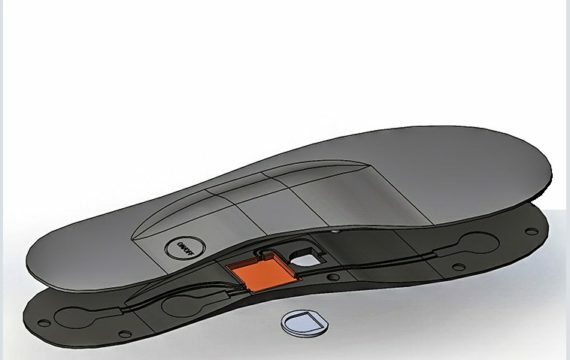 The insoles are wired with sensors which recognize what part of the foot each step lands on. The paired app shows the data in real-time, thus making it possible to immediately improve the way a runners foot strikes the ground. A proper technique could make all the difference in not just preventing injury, but improving performance as well. The insoles and app are there for those runners who want to simply gather information about the way they run and professional athletes. It could, however, be more interesting for those recovering from an injury. It will tell them exactly how to modify their running style, making sure that they don’t overbear certain parts of their feet. The sensing insole won the Silver Medal at the 45th International Exhibition of Inventions of Geneva, Switzerland in March this year.